Groundhog day is a fun time for kids because there is always the excitement of whether the groundhog will see its shadow. Will there be six more weeks of winter? Kids will be interested to know that it is actually a sunny day that indicates six more weeks of winter. The groundhog can’t see its shadow on a cloudy day (or so the legend goes)! 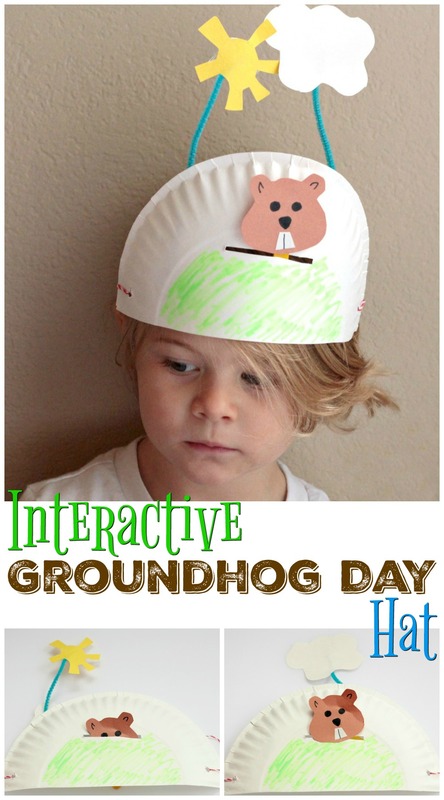 No matter whether the groundhog sees its shadow or not, kids can celebrate with this interactive groundhog day hat. 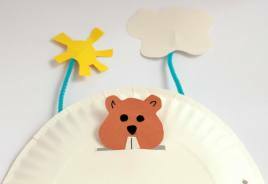 This is such a a fun groundhog craft! If there will be more winter, kids can hide the cloud and push the groundhog back in its hold. If winter is over, kids can hold up the cloud and let the groundhog come out! Before we begin, I always like to introduce to you some of my favorite books to go along with the craft. Here are some fun groundhog day books! Cut the paper plate in half. Each child will get one half. 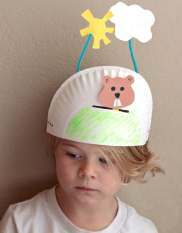 Punch two holes into either side of the flat side of the paper plate.Tie a string of elastic to each hole to make a hat. Cut the popsicle sticks into 3-inch long pieces. 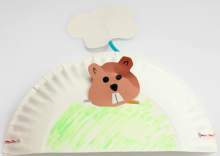 Make a groundhog face from brown construction paper about 2 inches tall and 3 inches wide. Cut little buck teeth from paper and glue them to the groundhog’s face. Draw eyes and a nose with a black marker. Tape the groundhog’s head to one end of the popsicle stick. Cut the pipe cleaner stem in half. 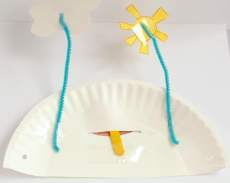 Cut a cloud and sun from construction paper and tape each one to one of the pipe cleaner stem pieces. The next part is just a little tricky. Fold the tape in half lengthwise so it sticks to itself. You are making a holder for the popsicle stick so it can slide up and down and make the groundhog come in and out of its hole. 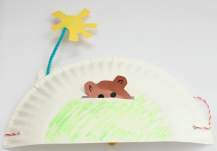 Place the popsicle stick inside the slot in the paper plate with the groundhog’s face visible from the front of the plate, but the stick is hidden in the back. Use the strip of non-sticky tape to hold the popsicle stick in place. Tape the two ends of the non-sticky tape to the paper plate. This will hold the popsicle stick in place. Tape it tightly enough so that the popsicle stick won’t fall but will either keep the groundhog in or out of its hole. Tape the open ends of the pipe cleaner stems to either side of the popsicle stick on the back of the hat. Let the kids decorate the front of their groundhog hats. If the groundhog sees its shadow, hide the cloud and show the sun. Push the groundhog inside the hole. If the groundhog doesn’t see its shadow, hide the sun and push the groundhog out. Winter is over! Need some Fun Winter Literacy Ideas for your classroom? 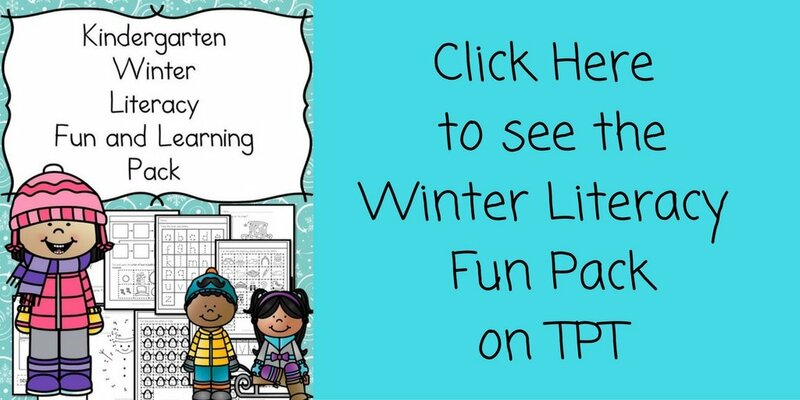 Check out our Winter Literacy Fun Pack on TPT!